PRO Homogenizers are ideal tissue homogenizers with their precision crafted very narrow clearance between the inner rotating shaft and outer tube/chamber. This allows for quick, effective and repetitive tissue homogenizing. This means you will get the results you want each and every time whether it is animal or plant tissue. The variable speed of our homogenizers allows for maximum homogenization or if necessary for the preservation of all tissues including organelles, large molecules, and viruses. Most homogenization can be completed in a matter of seconds which eliminates heat production and ensures preservation of the tissue sample. The Bio-Gen PRO200 Homogenizer with a 5mm or 7mm Generator Probe. Concerned about cross contamination between your tissue homogenizer samples? 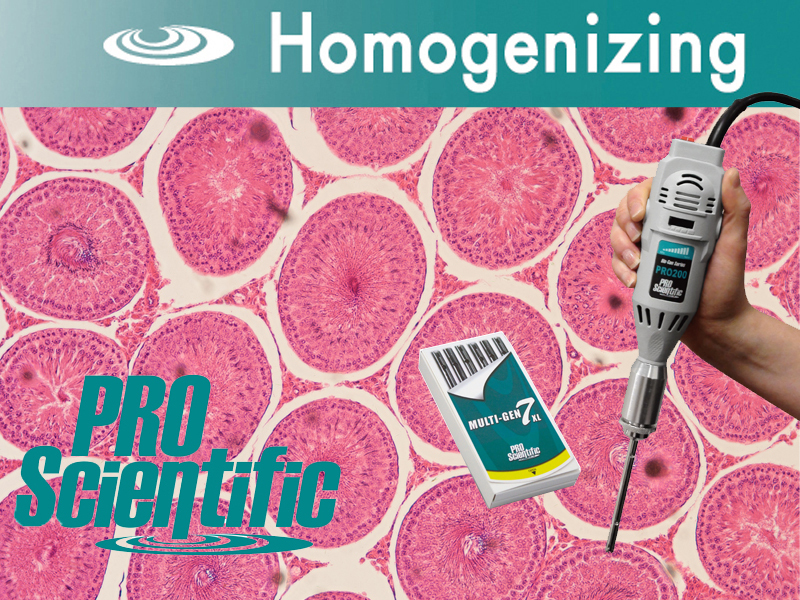 Try the Bio-Gen PRO200 Homogenizer with the Multi-Gen 7XL 12-Pack of Stainless Steel Probes. Need a small volume tissue homogenizer? The Micro-Homogenzing Package Kit has everything you need to begin homogenizing your tissue samples in tubes as small as .5ml. Homogenizing larger tissue samples of 10mm or larger? Our PRO250 Homogenizer with a 20mm generator probe probe or larger is ideal.